I know you can only order the bus ticket 20 days in advance but we are leaving Canada next week and I was hoping to have the bus tickets bought and paid for before we left. Is it possible to do this, and you just book the tickets as soon as permitted. 1.Can you confirm the bus leaves from Hangzhou West Station? and that it takes 180 minutes with one rest stop? 2. Do people smoke on the bus? If yes, is there a section for NO SMOKING. 3. Are the seats assigned when buying tickets? If yes, is it possible to get them closer to the front and not in the back? 4. Is there a limit for luggage? We have 2 airplane size carry-on bags, and 1 slight larger suitcase. Is there a luggage container under the bus with access from outside only? 5. Is is relatively safe to leave bags in the luggage hold or do we need to watch them carefully, at the rest stop for example? 6. Once the tickets are purchased, do we pick them up at the bus station, showing our passports? Which window do we go to pick up tickets? 7. Is a taxi the best way to go from the airport to the West Bus Station? Do the taxis use meters? What is the approximate travel time and cost for the taxi? Hangzhou to Huangshan bus tickets are sold maximum 10 days in advance now, so we will not be able to book your ticket until it allows. As long as you can check your email during the trip abroad, you will have no problem to receive the booking record and collect your ticket. I would advise you create another email through Yahoo or Hotmail so that we can send the booking record to one more email address to make sure you can get the booking record in case the current email box you are using turns unavailable while you are getting around China. We don't recommend Gmail to you as it's blocked here. 1. I can make sure bus for Huangshan Tunxi leaves from Hangzhou West Bus Station. Riding distance is 230 km and riding time is about 3 hours, sometimes, it can be a bit longer or even a bit shorter, depending on traffic condition. 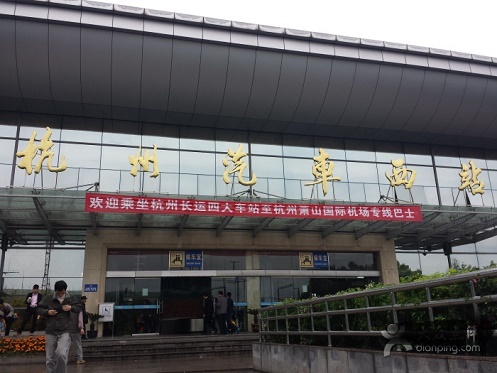 We knew its terminal station is Huangshan Tunxi and we can't confirm if it has middle stop(s) along the road. Most likely, it will go to Huangshan Tunxi directly without stopping on the road. According to related passenger transportation regulation, only buses with riding time over 4 hours are compulsory to make stop during the journey. 2. The bus doesn't have smoking area, as long as we knew. In fact, it is not allowed to smoke on the bus at all. In case you find someone smoking on the riding bus you can report the matter to the driver or the conductor and let them to stop him/her. Some buses may stop at the service areas and drop off passengers to let them take rest, smoke and etc. 3. Yes, you will be assigned with a seat on each ticket. We will book your ticket in the first time and make sure you can get two front seats instead of that in the back part. 4. You can put the luggage into the trunk, luggage container and etc depending on layout of the bus. We don't deal with luggage matter here as people at the bus station has final right to decide if you should pay or not for the luggage. They will require you to pay in case they find your luggage is too big or too heavy. 5. Safety is a relative conception, there is not absolute safety in the world. So it worth you to pay special attention to your luggage along the way, especially at the service area and the terminal station when people are dropping off frequently. Sometimes, people may take your luggage in mistake as they may confound your luggage with their own. Please put money and other valuables in a secure pocket and don't leave them out of your sight while you are traveling. 6. There are two ways to collect tickets, one is from the ticket machine using the ticket pick up number which is listed on the booking record and another is to collect ticket directly from the ticket window by submitting your passport and the booking record we will provide to the ticket person. Ticket machine would not work for you as you may not be able to read Chinese interface unless you can find someone to help you. So most of our customers would go to the ticket window to collect ticket. You can collect ticket from any ticket window, unless the worker at Hangzhou West Bus Station points out to you a special window. No fee is required to collect ticket. 7. You can take taxi to get from Hangzhou Airport to Hangzhou West Bus Station and all legal taxi use meters. Riding time would be about 80 minutes and rough cost would be CNY 200 Yuan. Another way is to travel by airport bus, you can find airport bus schedule and fares here http://www.chinabusguide.com/hangzhou-airport-to-hangzhou-west.html. Personally, I would choose airport bus as it's more economic and stable. PS: If you feel the article is helpful, please share this link to other people through your social media account, travel blog and etc.